Albany Wiseman, illustration from Tommy Atkins, watercolour, 23 x 35cm. This month the Curwen Gallery in Windmill Street is to mark 100 years since the start of World War 1 with a special art exhibition. Tommy Atkins In the Great War is an illustrated storybook intended for young children to gain an understanding of the tragic events in the First World War. The book tells the story of a soldier called Tommy Atkins in a way that deals sensitively with the horrors of war but with a lightness of touch that makes it suitable for children to read. Devised by Robin Ollington and Illustrated by Albany Wiseman the book was published in 2006. 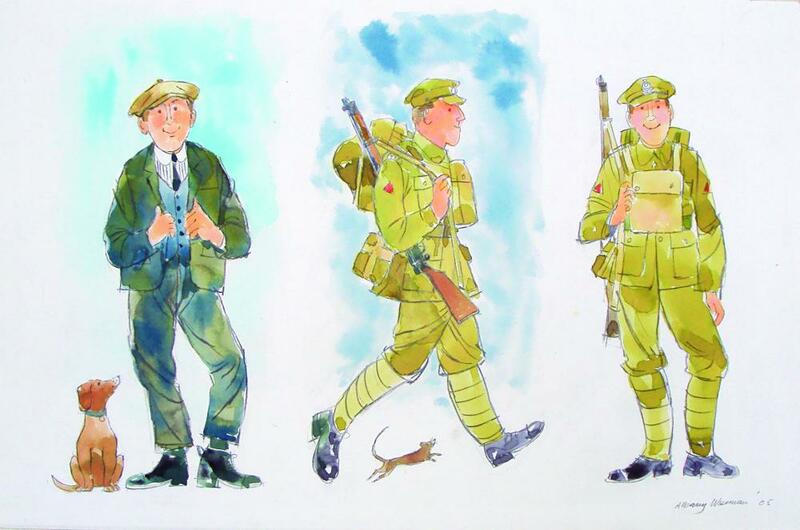 The original watercolour illustrations from the book are showcased in this exhibition along with sculpture and drawings by James Butler RA and military cartoons by Robin Ollington. Tommy Atkins in The Great War, devised by Robin Ollington, illustrated by Albany Wiseman, developed and designed by David Edgell and Duncan Youel. Published by Tommy Atkins productions Ltd, 2006. Available for sale at the exhibition for £9.99. Marking the Centenary of The First World War: 4-17 June, Curwen Gallery, 34 Windmill Street, London W1T 2JR. Private view 6-8pm Tuesday 3 June 2014. A donation from artwork sale profits will be made to The Not Forgotten Association.